Thousands of troops were deployed in Thailand as rival political groups held separate protests, one of which turned violent. Crowds of demonstrators turned out in Bangkok to mark the third anniversary of the coup which ousted controversial Prime Minister Thaksin Shinawatra. On the Cambodian border an anti-Thaksin group clashed with police as it tried to enter a disputed border temple. Several people were injured and one man was shot in the neck, an official said. Security forces and local villagers had set up roadblocks to try to prevent the group entering the 11th century Preah Vihear site, the scene of deadly shootings between Cambodian and Thai troops in recent months. In Bangkok, thousands of troops and police were ordered onto the streets ahead of the protest by Mr Thaksin's red-shirted supporters. Mr Thaksin himself is in overseas exile, and has been convicted in absentia of corruption. In a speech to his supporters via videolink, he called for national reconciliation. "Our country has deteriorated and risks being a failed state. I have already forgiven everybody, let's start anew and decide on new elections," he was quoted as saying by AFP news agency. Mr Thaksin won elections in 2001 and 2005, swept to office by a wave of support from rural voters whose concerns he worked to address. After he was ousted, his allies won the first post-coup elections in 2007. But protests - including a blockade of Bangkok's two international airports - by those who opposed him, the yellow-shirted People's Alliance for Democracy (PAD), forced that government from office, allowing the party they backed to form a coalition. 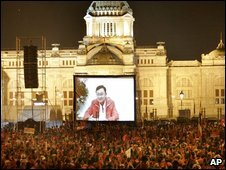 The red camp want fresh elections and a pardon for Mr Thaksin. Their last rally, in April, ended in violence, with several buses burned and dozens of people injured. By early evening, several thousand demonstrators had joined the protests, police said. "This will be a peaceful protest and will end by midnight if the government does not use violence," Red Shirt leader Jatuporn Promphan said. The yellow camp, meanwhile, battled riot police and local villagers near Preah Vihear, the temple complex at the heart of a border dispute between Thailand and Cambodia. An international court awarded the temple area to Cambodia in 1962, but disputes over land surrounding it have never been resolved. The PAD says the government must eject Cambodian troops from what they perceive as Thai territory. About 4,000 PAD supporters had joined the protest, reports said, and had broken through barricades to reach the foot of the temple. Both Thailand and Cambodia deployed troops there last year after the temple was awarded Unesco World Heritage status, raising nationalist sentiment on either side. Since then there have been several deadly exchanges of fire across the border.